(white grape) Also known as the Faberrebe. It was first created by Georg Scheu at Alzey in 1929 It is a product of the crossing of the Weissburgunder and Muller-Thurgau to achieve frost resistance. It is a variety with high acid used for blending in the Rheinhessen region of Germany . There are about 1,500 ha in production. 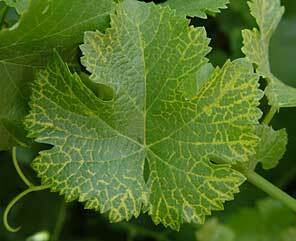 One of the prominant virus diseases of grape vines. One of its symptoms is that part of the leaf becomes misshapen, giving the appearance of a small fan. Tasting term to describe a wine that has an overly thick, soft and flabby mouthfeel, lacking crispness. Fat wines invariably have too-high pH levels (too low acidity) and fail to improve with age. A special category for wines from Wachau in Austria. These medium bodied wines have an alcohol content of no more than 12.5 %, are dry, and may not be chaptalized. A really young wine in fact one that's not finished fermenting? In some German regions you can buy glasses of Federweiss (White Feather), which is wine that's still fermenting. It's available for a very short period each year, of course, and it's bright, frothy, fruity and delicious.Why "Federweiss?" Because the fizzy action of fermentation gives an impression of white feathers in your glass. An halbtrocken style, with 18 to 45 g/l of residual sugar. Originally, "to boil without heat." The process, carried on by yeast growth in grape juice or other sugar solutions, by which sugar is transformed into ethyl alcohol and CO2. The CO2 bubbles out of solution, giving the appearance of boiling without heat. Through fermentation, grape juice (containing sugar) is transformed into wine, which contains alcohol where the sugar originally was. Most of the other constituents of the original grape juice are essentially unchanged by the process of fermentation. Statement made about a wine which was fermented with the juice and skins together. Separation and discarding of solids is done only after the fermentation is completed. Common name given to tanks, barrels or other containers when they are used for fermentations. "Fermenters" may be used after the fermenting season as normal storage tanks. When used for storage, no one refers to them as fermenters, even though everyone knows they will become fermenters again next fall. A method of grafting grape vines, used especially in coastal California, in which the rootstocks are planted and allowed to grow for nearly a whole season before the grafting takes place. Then, rather than making a traditional woody graft, the workman in early September attaches a small chip (containing only one dormant bud of the desired fruiting variety) to the rootstock at just above ground level. The cambium layers must be held in good contact so that, as the vine continues to grow, a callous material forms around the cut, sealing it permanently. The chip is held in place and sealed from drying by wrapping the stem with a small piece of rubber strip. After this, the whole stem of the plant, including the budded section, is covered with several inches of loose earth, to keep the new bud shaded and cool so it will not begin to grow immediately. 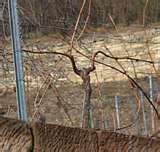 The vine then finishes its normal period of autumn maturation and goes into dormancy within several weeks. It is not touched again until the following spring. In spring, the worker uncovers the loose earth exposing the wrapped bud on the stem of the rooting. He cuts the rubber tape and checks to see that the bud has indeed become calloused firmly onto the stem. If so, he then cuts the vine off just above the bud so that there is no viable part of the vine left above the bud except the bud itself. Now, as the roots begin to allow sap to push upwards, the only bud available for growth is that which was added the previous September. This bud begins to grow, elongating into a vigorous shoot which can often grow to three feet in length within six weeks. Because it is delicate and friable, the new shoot must be tied every few inches to prevent breakage caused by the wind. It is this shoot which becomes the trunk of the new vine during this, its first year of active growth. The act of passing a wine through some tightly bound matrix in order to force the liquid to pass through while keeping the suspended solids behind. The purpose of filtration is simply to clarify the liquid -- to remove sediment or suspended solid particles from the wine. The matrix may be a tightly woven cloth, paper, polymer, or some tightly packed insoluble powder such as diatomaceous earth. In previous decades, asbestos was used as a filter medium but now that it is known to cause a health hazard, asbestos is no longer used. (white grape) This is a mutation of the Muller Thurgau. There are less than 50 ha planted in the Mosel region. Tasting term which means just about what you'd expect it to mean, that the wine is so perfectly balanced that nothing sticks out. All components balance each other in a way which makes the whole thing even more smooth, understated and perfect. The last impression left in the mouth by the taste of a wine. The final steps in processing a wine before bottling. Often, this includes fining, blending and filtration or centrifugation and may include bottling. Tasting term for a wine which is too low in acidity, too high in pH and difficult to drink. Flabby wines taste "fat" and retain an unpleasantly thick mouthfeel. See Fat. The German name for a training system like the Guyot whereby one cane is laid horizontally either side of the head, and shoots trained vertically between foliage wires. The shoots are trimmed at the top. Tasting term for a wine that is too low in acidity but may not necessarily have a fat or thick mouthfeel. Otherwise similar to flabby, a flat wine is lacking in crispness, as if something important is missing from the wine. Flat wines are difficult to drink and enjoy even if the flavour is good. In sparkling wines flat means the wine lacks carbonation. Tasting term used to describe wine with a hard, austere, dry and crisp or sharp mouthfeel. Often used for a clean white wine such as Chablis which has a bouquet and taste reminiscent of flint struck by steel. 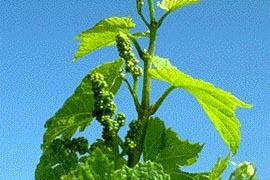 The flowering or bloom period of grape vines. This happens with most grape varieties in most regions about two months after bud break. New pinhead sized green berries form after floraison, then enlarge to become grapes. Method of wine clarification involving the introduction of inert gas at the bottom of a vat of must causing suspended solids to be carried to the surface where they can be easily removed. Tasting term for wine with an exceptionally aromatic character reminiscent of fresh garden flowers. Vineyard remodelling to improve access to vinreyards and make the vines accessable, replanting of slopes to up-and-down rows instead of terracing.This was done on a large scale and reduced the individual vineyard names but not overall size. (white grape) Derived from a Silvaner x Madeleine Angevine cross. Frost-hardy in a good site. Reported as having sugars and acidity higher than Müller-Thurgau. Used to make a varietal white wine claimed to have profile similarities to Pinot Gris. A tasting term. This denotes a wine which is felt by the taster to be developing quickly, and is ready to drink before it might otherwise be expected. Descriptive term for wines produced in Franconia, in central Germany. The major wine variety grown in Franconia is Sylvaner, although Riesling, Muller-Thurgau and Gewurztraminer can be found, as well as some Spatburgunder. The juice which separates from must by draining alone (without pressing). On the label may refer to the owner if he is a Baron. (white grape) This crossing was created in 1916, developed at the Freiburg Institute, Germany . from the Silvaner and Pinot Gris. It is mostly planted in the Baden region. Tasting term for wine which has retained the fresh flavour of the grapes used in its fermentation. (red grape) This is an ancient version of the Pinot Noir it has small berries. It ripens earlier than the Pinot Noir hence its name. It came originally from the Ahr district but is now being grown in Sachsen and Franken. It likes slate soils. 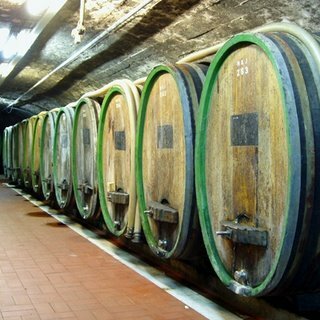 German name for Ovalwine casks which hold about 1,000 liters used in the Mosel. On the label may refer to the owner if he is a Prince. Sterilization of barrels by burning sulfur wicks in otherwise closed barrels. The sulfur uses up oxygen from inside the barrel as it burns, forming sulfur dioxide (SO2). The combination of SO2 and lack of oxygen generally stops the action of yeasts and bacteria in a barrel. It is then necessary only to wash the barrel and refill it with wine for aging. Only with heavily infected barrels is it necessary to sterilize the barrel further. Not really an oil in the usual sense. Fusel oil is made up primarily of higher alcohols and is obtained by distillation of lees or wine into brandy. Much of the flavour of brandy can be identified as the higher alcohols and their esters, all of which are collectively known as fusel oil. Concentrated fusel oil floats in a layer on top of water, appearing as a green oil.